Instrument P.I. : Shinsuke Abe, University of Kobe, Japan. 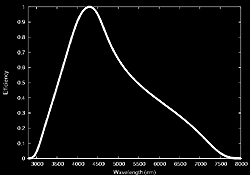 Technique: Intensified near-UV slit-less spectroscopy on High Definition TV. Scientific objective: Measure near-UV emissions of N2+ and CN molecules from air plasma and ablation products. Instrument: The instrument consists of an intensified High definition TV camera equipped with a transmission grating with 600 grooves per mm, blazed at 550 nm, made by Jobin Yvon. The camera has a blue sensitive 1-inch 2M-pixel FIT CCD, which has a resolution of 1150 TV lines. A 50 mm f1.0 lens provides a large 37 x 21 degree field of view. No coaligned camera is needed. Heritage: This camera was deployed during the 2002 Leonid MAC mission in a 60 degree port (see photo). Now camera operated on swivel mount in low window. Aircraft hardware requirements: Window swivel mount. Rack mounted recorder and control unit. Stow box for camera only. Quartz window. 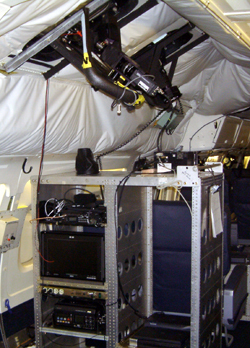 Instrument validation tests: This camera has been used extensively in past Leonid MAC missions. Sensitivity: Spectra of meteors as faint as +5 magnitude have been recorded with this instrument. Dynamic range: 10-bit (factor 1024). Frame rate and exposure times: Frame rate is 30 frames per second (60 fields per second). 2.2 nm FWHM in first order.